Very well-made and sturdy Bag Clip. This works for handbags, groceries and shopping bags. Helps to secure handbags in cars and reduce stress on hands when carrying packages. Bought one for me and one for a friend. Great gift! All the daughters and daughters-in-law received this in Christmas stockings, and they are finding them very useful for holding bags in the front seat! So many uses, including keeping my beloved pet safe! From the moment I saw this I knew I would love it. I originally gave them as gifts to my Mom and then sister, and eventually got one for myself. I work in the city and have to deal with crazy traffic and all kinds of insanity so my purse would often end up on the floor of my passenger’s side with half it’s contents spilled out... I’ve also used this to help make carrying multiple bags much easier but by far the most important use for me was securing my pet carrier to the car seat when driving to the vet. That trip always made me so nervous and while I still drove like a new parent taking their baby home from the hospital, I felt so much safer knowing that if something terrible happened this tool would keep my beloved companion secured in place. Peace of mind is priceless. Thank you. Everyone is getting one of these in their Christmas stocking! Great for not spilling your purse, keeping my first grandchild's diaper bag easily accessible, and travel. Not a chick thing at all! Great quality and very easy to attach and detach. Thank you! Keeps purse and/or small packages right on the seat - not spilled on the floor. Easy to use. Daughter-in-law also uses for diaper bag and turned to the back seat to hold children's items in place. and it worked! She is very stoked! I love 5hese handbag handcuffs!! I bought several and gave them for gifts. Everyone was thrilled to get them! Was so so surprised how sturdy and well made this was. My purse and bags are finally staying in their place. Love love it. My use for this product is a bit unusual. When I purchased my first handcuff, my husband thought it was a bit frivolous, of course, I did not. With a sudden turn of events, my husband is on oxygen 24/7 and when he wants to go anywhere he carries a portable oxygen tank. It is in a carrying bag with a shoulder strap and a handheld strap. One day I was trying to come up with a way to secure this bag while traveling and it dawned on me that this would fit the bill perfectly. He has used it ever since and I have purchased another for my car. I think a bit of humble pie is in order for him, don't you think? It goes everywhere with me and I’ll be ordering more for gifts. Well made. Clever. Women choose their handbags carefully, often spending a small fortune on them. Yet, in the car or in a restaurant, the only place for the bags we love is on a dirty floor. Now you can give your pocketbook a little pick me up with the Handbag Handcuff, the perfect complement to your favorite purse. Tired of watching her handbag tumble off the front seat and spill every time she hit the brakes, busy mom Beth Corets decided to do something about it. The idea for the Handbag Handcuff came to her while driving, so it's only natural that she sketched the design right then and there in her car. This smart, stylish accessory works just as great as it looks. In the car, simply cuff one carabiner to the passenger headrest post and the other to the strap of your bag to keep it in place. In a restaurant, hook it to the back of your chair. 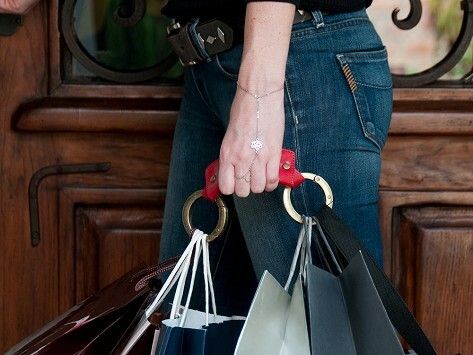 The Handbag Handcuff can also help protect your personal items from loss, or worse, sticky fingers, when clipped to your grocery cart, baby stroller, or to your luggage while traveling. Designed to hold up and do no harm, the Handbag Handcuff pouch is composed of vegan-friendly materials and the hardware is of made of zinc alloy, free of cadmium and lead.